Major changes were in the wind at Burroughs as the B5900 began production. At Mission Viejo, Ron Delaura had left and Ron Tucker was now Engineering Manager. Arnold Spielberg was made A Series Corporate Coordinator, responsible for making sure all systems plants built E-mode compatible machines, and shared as much design methodology as practical. Paul Mirabito was ready to retire, and the board had been searching for a new CEO. In 1980 the board decided to go outside the company and hire Michael Blumenthal, former Treasury Secretary under the Carter Administration. I was very curious about Blumenthal’s background, and what I found was not encouraging to me. Blumenthal had a financial background, like Mirabito, which I thought was not enough at this critical time. Mirabito at least had the advantage of coming up the ranks in a computer company; Blumenthal had been CEO of Bendix, an automotive component manufacturer. Bendix sold to other manufacturers, mainly the auto companies in Detroit. Burroughs sold to a wide range of customers, banks, government, etc. Bendix was a sick company; its stock was very depressed. Blumenthal’s solution to Bendix’s problems was to create a conglomerate of other sick companies. While this temporarily increased revenue and profit, by the time he left Bendix it was on its way down and was taken over by Allied Signal under a cloud of impropriety. Burroughs had been drifting for the last three years. Internal politics like the BCML fiasco and the turf war with medium systems was taking its toll. Burroughs needed a strong leader, who understood the industry and the customers. 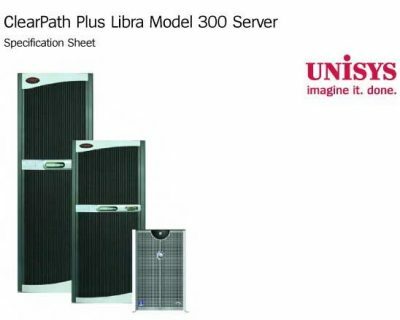 IBM, with it’s 370 family of mainframes had rolled over the competition. Over the last fifteen years, since the system 360 was first delivered, many mainframe companies had quit the business. At this point in time IBM was the largest mainframe company, with about 80% of the business. Burroughs was second, with about 10%, Sperry Univac was third with about 5%, and all others represented the last 5%. I was very concerned that Blumenthal was not up to the task of being CEO of a company like Burroughs. In the end I was proven correct. But in the interim more changes were in store. The Rancho Bernardo plant, that made BCML and CMOS chips for Burroughs, was a disaster. Costs were high, yield was low, and delivery to schedule was bad. Corporate decided to put Erv Hauck in charge. He was promoted to Vice President and given free reign at Rancho. Erv would try to fix Rancho for three years, but in the end even he could not get them on track. Rancho was closed in the mid 80’s. Then it was announced that Santa Barbara would be closed. The Santa Barbara plant had been one of the newest Computer Systems group plants in California, but shortly after Burroughs built it the city of Santa Barbara adopted a number of ordinances hostile to business. One of the most damaging was a water use moratorium, which effectively halted housing construction. As a result housing costs skyrocketed, which made it difficult for Burroughs to attract labor to the plant. After our architecture meeting in Detroit the decision was made that future Small Systems (the systems that Santa Barbara was to produce) would be based on E-mode. In addition, it was clear that the amount of space and labor needed to produce future mainframes would be drastically reduced. All these factors led to the decision to close Santa Barbara and relocate the Santa Barbara engineering and manufacturing to Mission Viejo. With Erv gone CSG needed a General Manager for Mission Viejo. So, shortly after I returned from Santa Barbara, Joe Trost followed us to take over as General Manager of Mission Viejo. A few months later Hans Birchmeier and most of his engineers would follow. My concerns about Michael Blumenthal were confirmed during a “get to know the company” visit by Blumenthal to Mission Viejo in the spring of 1981. He arrived by helicopter with Bob Merrell in tow, and his new chief operating officer, Paul Stern. Stern had worked with Blumenthal at Bendix. Now Blumenthal hired him away from Bendix, promising him the Presidents position. I talked to them briefly, they wanted a tour of the labs, and we showed them the B5900, and the new cost reduced version we were beginning work on, the B5920. From the questions he asked and our brief conversation, I came to the conclusion that he really did not know anything about our product, and even less about our customers. My general feeling was he did not see how computers were of much use to anyone! This right on the cusp of the most exciting revolution in technology, the PC. The final straw was when, a few weeks after his visit a request was made. Could one of the B5900 team engineers join him in Detroit to help him understand technology? The thing was, he did not ask us who the right person for that job would be. He wanted Barbara Bennett, a young, pretty, inexperienced software engineer who had joined our team a short time before. I had her do a short presentation on her work, and apparently Blumenthal became interested in her. I felt he wanted a girlfriend, not a technical liaison. My suspicions on this were confirmed a couple of years later when he divorced his wife and married her. My confidence in this new management was about zero. Meanwhile all around me in California I was seeing new companies springing up with revolutionary new products. Most of these companies were headed by Engineers and Scientists, not Financial manipulators. CEO’s like Gordon Moore and Robert Noyce of Intel were nothing like Blumenthal and Stern. In addition, I was becoming concerned about where I would end up in the new pecking order. My group was given several interesting assignments, but no new development. We worked on the Air Force contract, which would have resulted in a couple of hundred B5900 sales. The Air Force had been using the B2500 medium systems but did not want to continue with the medium systems. Like Midlands Bank they wanted their larger systems to be code compatible with the distributed Medium systems. 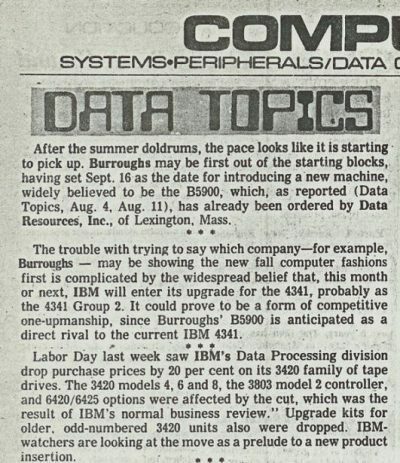 Burroughs bid the B5900, but we were in competition with Sperry and IBM. The Air Force had a “fly off” where they benchmarked all three companies. Burroughs won the fly off with the E-mode computers for both performance and compatibility, but part of the bid was a fixed price maintenance contract, and Burroughs was much higher than the others. Add to that fact that the new administration was Republican, and our new CEO was a prominent Democrat (another smart move by the board), and the result was Burroughs lost the bid. Another major project, one that Burroughs won, was the World Bank. They were setting up an automated funds transfer system for the world, with centers in every major country. Two to four B5900 and B6900 systems would populate each of these centers. They required several security enhancements to the Console, and we were able to make them quickly because we used the microprocessor controlled Display Terminal. Burroughs Brazil, one of the corporation’s oldest overseas markets, decided the B5900 was the right machine for them. They came to the plant and we spent a couple of weeks educating them. I sent Cas Pencak down to Brazil in the spring of 1981 for two months to help them get up and running. Brazil continued to build and enhance the B5900 for several years after it ended production in the US. A version of the B5900 was upgraded and sold as the B6910 Advanced in the Brazil market. We also were asked to develop a low profile, physically more compact version of the machine. 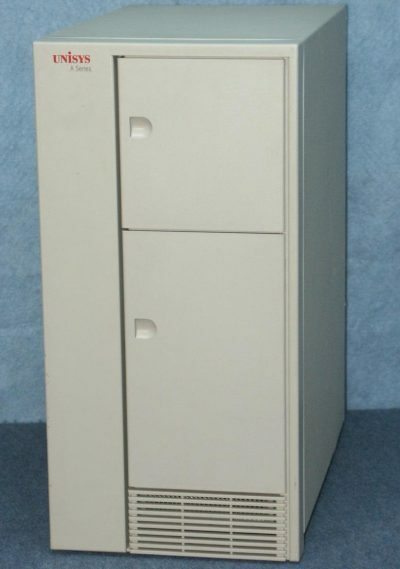 It was called the B5920 and was liked by the customers for its space saving design. Arnold Spielberg ran that program, and it became the standard for future cabinet design for the A-series mainframes. We started working on the specification for the A7, my intention was to build it using ECL logic. But because of the management transition in Detroit, and our new General Manager, no new projects were moving forward. They wanted to “re-evaluate” the company product line. Pasadena was still fighting for the Medium Systems, but I felt they would lose that battle, and suffer the same fate as Santa Barbara, which did happen a few of years later. So I began to worry, where would I fit in? More senior managers would be needing a job, and the A7 fit in the product line where many twenty and thirty year veteran managers were now residing. Then, in the winter of 1980 Ron Tucker was reassigned to help Erv Hauck at Rancho Bernardo, Mission Viejo needed a new Hardware Engineering Department Manager. The choice was narrowed down to me or Bob Leamy. I was looked at as a shining star at the corporation, I was the youngest systems engineering manager in the company’s history, I was the youngest section manager. My picture was in the 1980 annual report. But Bob had a lot more seniority, he had worked on the flagship products of the Mission Viejo plant, he had gone back and gotten his MBA, it was a tough decision. In the end, Bob was chosen ad Department Manager, and that, along with my other concerns, solidified my decision to end my career at Burroughs. My friend Bjorn Dahlberg at HiLevel Technology had, with my input and support, developed a superior bit slice development system. His company was struggling because of his lack of management skills. He asked me to join the company and offered me 10% of the company in stock options. I decided to take the offer. When I told Bob Leamy and Joe Trost, they did not seem that unhappy, but John McClintock and Don Swanson were crestfallen. They felt I revolutionized the company’s mainframes and should have a prominent position at the company. I think Bob saw me as a competitor who he would no longer have to deal with. The B6900 group was not in love with the B5900 group. Joe Trost had his own problems playing corporate politics. I did not have the same relationship with him that I had with Erv. Bob Merrell called me and was very unhappy. “Jack how are we going to compete with IBM in the future without you contributing?” I told him of some of my concerns, and he admitted privately that he had some of the same concerns. Bob Merrell, John McClintock and Don Swanson arranged for me to meet with Paul Stern, to maybe take a corporate job on his staff. I flew to Detroit and met with Paul. We had a lengthy discussion, but I did not see anything I liked in his style. He was very cold and seemed to live by the financial spreadsheet. It was clear to me that they were looking at doing a rollup. Now I am all for numbers, I went to Sloan School, but there has to be some gut conviction along with that. He seemed to feel that he had to be smarter than anyone around him, that they should worship his intellect. I made it very clear to him, I was an MIT graduate, and knew a lot more about computers than he did. Rolling up incompatible computer architectures was not going to work well. He did not like that. My concern about the corporate direction was even stronger. I did not ask him for a position on his staff, and he did not offer one. Two weeks later my engineers held a going away lunch for me at El Toritos. Joe, Bob, John, and Bill all came, and even Erv and Ron came up from Rancho Bernardo. We said our goodbyes in June of 1981, and I began a new era in my career. 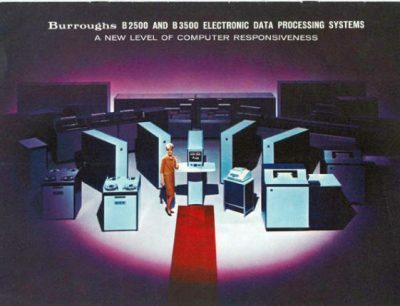 Three years after I left Burroughs Michael Blumenthal engineering the merger of Burroughs with Univac. 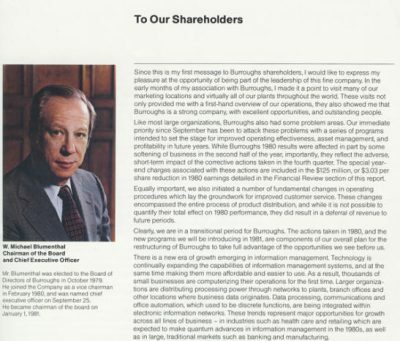 In 1985 the company was renamed Unisys and the name Burroughs faded from the corporate world. Arnold Spielberg did not retire from Unisys until 1992, during that time he continued to coordinate the A series, which later became Unisys ClearPath MCP, and is still a major profit center for Unisys today.